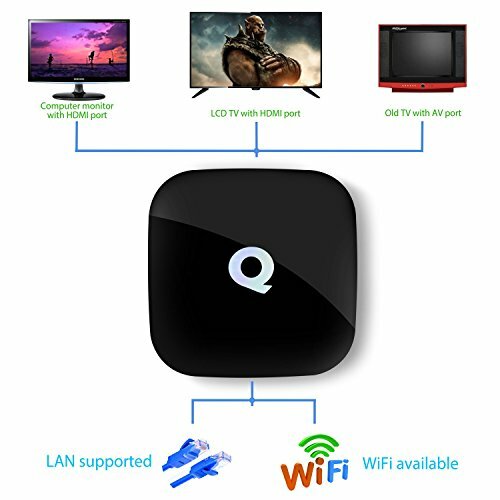 Q-Box Built-in KODI (XBMC),Tons of free streaming add-ons available for Kodi so you can cancel your satellite or cable service and enjoy streaming your favorite shows and movies from anywhere in the world! 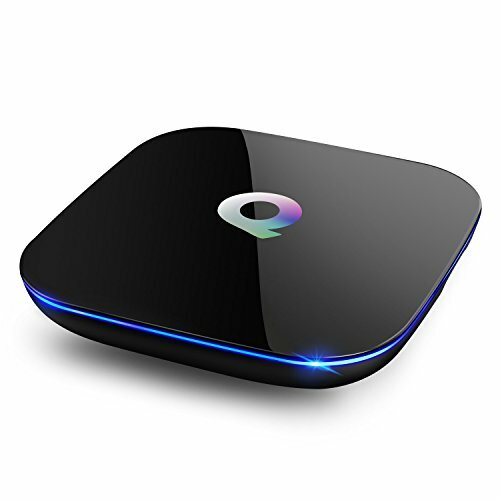 Q-Box is based on 64 Bit Amligic S905 solution, the MOST professtional Quad core CPU performance for Network TV Box. Full Quad core,2GHz Ultra high frequency,more than 4 times performance improvements. 2G RAM(DDR3) + 16GB(EMMC),support Q-Box run fast and stable operation,the 16GB internal storage gives you space and freedom to install apps without having to always worry about running out of space. Hi guys! 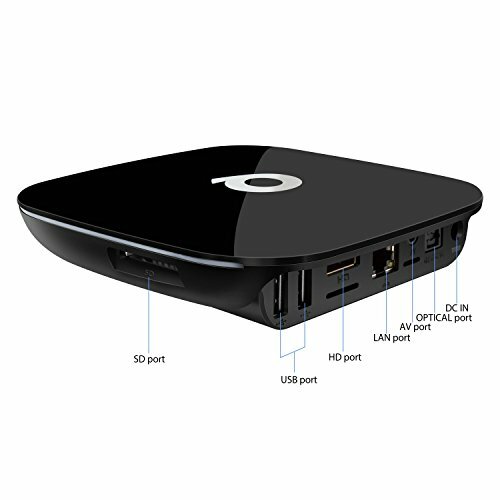 Today we are looking at another Amlogic S905 TV Box. This is called the Q-Box. It’s currently retailing for about £60, so it’s a little pricier compared to some of the stuff that we’ve looked at recently, like the M8S Plus or the Nexbox A95X, but with that in mind there are also some advantages to it that kind of make it worthy of that extra few quid. For one, it uses 16GB of internal storage, so it’s double the storage capacity of the others. It also incorporates 5 Gigahertz dual-band Wi-Fi and gigabit Ethernet. It also allows for Dolby Digital Surround Sound via the optical or SPDIF port on the back, so for that extra twenty quid you’re kind of getting those four features. The rest of the stuff is pretty standard for the Amlogic S905 processor. We get Android 5.1, a Mali-450 Penta-core GPU, 2 gigs of DDR3 RAM, Bluetooth 4.0, and support for 2K and 4K Ultra High Definition videos. All right. So, let’s unbox this thing and get a better look at what the £60 is going to get you. The first thing that we have inside the box is the actual Q-Box. It’s really quite a simplistic looking device. There’s not much going on with it, with the exception of the back area. 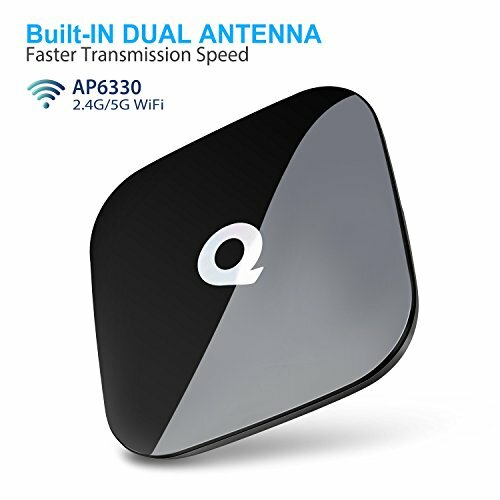 The Q-Box looks kind of like a router, in my opinion, as far as the form factor. But just to quickly go over it, it has a glossy, black piano finish. It’s definitely going to show fingerprints, dust, and smudges, and all that fun stuff so be aware of that. There’s also a silver, reflective Q logo on top. If you look at it from the front, it appears there’s nothing going on, but there’s this little ring that follows it around on both sides, which is an LED light. So when hen you plug it in, it’s going to glow blue from around the sides of the device and the front, could be distracting if you are planning to use in a dark room such as your bedroom. On the right hand side, we have a full-sized SD card slot. This can be used for a number of different things, like side loading applications, or playing music, videos, etc. On the back, we have two USB 2.0 ports for connecting any accessories or keyboards or whatever. There is an HDMI out, a Gigabit Ethernet port, 3.5mm audio, an SPDIF for connecting to your receiver or your TV for pass-through, and then a power in. On the left, nothing going on either. And on the bottom, pretty straight to the point as well, but we do have a little rubber ring here. And this kind of does two things. First, it helps with keeping the device flush. Since it does have a round form factor it needs this to sit evenly. And then it’s also there for stability. With that, it acts as a grippy surface and it prevents the box from moving around and sliding all over the place. That’s it for a quick overview on the Q-Box. We’re going to go more in depth with this in a little bit, but first, let’s finish the rest of the unboxing. Additional accessories can be found beneath a little insert in the box. It folds back, and the first thing that we have is our power adapter. If you are located elsewhere in the world, be sure to request an adapter piece for your region. We also have an HDMI cable. The HDMI cable is how you’ll be connecting the TV box to your display, whether it be a monitor, projector, a TV, or whatever. And then we have a remote control. This is how you’ll be navigating the user interface or operating the TV box, and it’s actually a really beefy remote control. It really does have a lot of functionality to it as well, especially when you compare it to other media players that retail for the same price range. I’m just going to quickly go over this. I would say, too, that it’s in no means a replacement for a keyboard, so if you really want the best experience, have a look at some of the best remotes for Android TV Boxes article that we did recently. We have a red power button on top, it’s used to wake the device remotely or to put it to sleep. On the opposite side we have a mute key. To go along with the mute key, there are volume keys to marginally increase it or decrease it as well. There are colored buttons at the top that are shortcuts that will launch you into specific applications. The red one will take you to your KODI, green is to your app drawer, yellow is to your video app, and then blue is to your browser. The two rows beneath the coloured buttons are actually buttons that are kind of specific to KODI. One will take you to the settings area, one will let you change your zoom, you can switch to your favorites or your bookmarks, different video or audio sources, activate subtitles, change the aspect ratio, and set the file that’s currently playing to repeat. And, to go along with those, we actually do have standard media playback controls. So there’s play and pause, stop, rewind, and fast forward. There’s actually a second set of rewind and fast forward keys here too. I’m not sure what the difference between the two sets being, but wanted to point that out. And then we have Android navigation keys. We have one for getting you to the Home screen, one for going back or returning, one for accessing the menu, this little cursor button down here actually activates a cursor on the screen, and then you can use the directional pad to navigate it, so it’s a really useful way of emulating a mouse without actually having to connect a mouse. And then there’s a search button here if you want to search within KODI, or within the stock Android UI. And then at the bottom we have our numeric keys for numeric input, and if we flip it around there’s also a battery compartment where it takes two AAA batteries to power the remote. Those are not included, so be sure to grab a pair for yourself. On the top, the last thing that we have is our IR sensor. This is how the remote communicates with the TV box. That is it for a quick overview of the remote, so let’s finish up the rest of the unboxing of the Q-Box. It looks like the last thing they’ve included in the retail packaging is some written documentation. This is the user manual, or the quick start guide. It’s going to be your one stop shop on how to use this device or how to operate it, so if you’re not familiar with it, be sure to read this before you actually plug it in. And it looks like that’s about it, so let’s get it hooked up now and see how it actually works. So here we are on the main screen of the Q-Box Launcher. This is called the S Win8 Launcher which is designed around replicating the metro start menu from Windows 8. But like always, if you are not happy with the way the launcher looks you can easily switch to a different one. I personally don’t like all of the colors that are going on here; it looks a little too wild for me. At the top here, we have our time, obviously. To the left of that is network interface icons. These will activate as you have different interfaces going, so right now we have Wi-Fi running and that’s why that’s showing, but Ethernet and Bluetooth will also appear here. These icons that you see are actually kind of doing two things. One of them, for example, like KODI, will take you directly into the app. The same applies to Browser. The rest of them are actually kind of folders, or subcategories that you can access from within the App Drawer. If we click ‘Apps’, this is our master app drawer- all of the apps that we have installed currently on the TV box. We have subcategories within the app drawer for things like video and music. So if we click into these, these will actually take us into the specified category, and we can even scroll over to the right to get back to the main screen of the app drawer, or to switch over to the music category. There’s also a few different things going on here on the right. We have this Clean Memory option. This allows you to kill tasks that are running in the background, so if you’re using up resources and you notice that your system seems bogged down, you can hit ‘Clean Memory’, and this should free up some RAM space for you and get some things running a little smoother. Settings will take you into the Android S905 Android TV style settings menu. I’m not going to go over this, but we have device settings for network and display, there’s preferences for your date and time, language, you can manage all of your Bluetooth gamepads and remotes from this area as well, and you have access to your account, and other security-related restrictions. Let’s switch over to Nova Launcher now for the rest of the video, and then in there we’re going to look at all of the usual stuff like benchmarks, video, and gaming. So here is a more traditional Android User Interface, more along the lines of what you see on your phone or your tablet. This is what I prefer, even though it’s not intended to be used on a TV I find that’s it’s just as easy to navigate with this thing than it would be with that other launcher that we just saw a second ago. Let’s get started with AnTuTu. So in AnTuTu, the Q-Box got a score of 35245. This is a very average score for the Amlogic S905 processor. The higher end of the score spectrum usually being about 38,000 or 39,000, so this is a little slower than some of the flagship boxes like the Minix Neo U1, but it’s on par with some of the other entry-level or mid-range Amlogic S905 media players, like the Nexbox A95X, the MK8O8B Pro or the Zidoo X9. They all score about in this approximate range here. In 3DMark, the Q-Box got an overall score of 4304 in the Ice Storm Extreme Test. 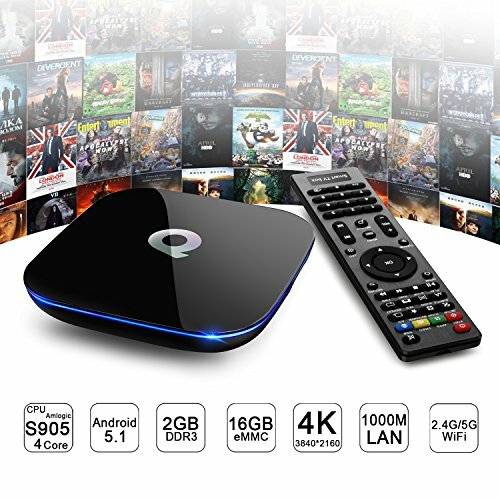 This is a very comparable score to what we’ve seen from other Amlogic S905 TV boxes, so it’s not a big surprise and it’s not a disappointment, either. It’s just an average score. Comparing with other boxes, they’re all using the same Mali-450 GPU so it’s not something I really expected to see a big difference in, but sometimes there are some minor inconsistencies. In this case, though, it seems to be pretty average. So that’s it for 3DMark, and to finish off the benchmarks, let’s next get a look at CPU-Z. CPU-Z isn’t really a benchmark, but it gives us a good look at the hardware. It detects the processor as a Cortex-A53 CPU, it has 4 cores and they run at 2 Gigahertz approximately. They’ll kind of range in their speeds based on what the load is, and they’ll actively kick in and actively stop based on what the load is as well. So right now since we’re not doing much other than looking at this page, we have one core running. The others are stopped, and that’s to save resources and save power. You can see the Mali-450 GPU again. The scaling governor is hotplug. Under ‘Device’, it’s a Q-Box (p200 2G), 1920 by 1080p pixels, 160 dpi, about 1800 megabytes of RAM, so it looks like we lose 200 megabytes somewhere. And then the storage, the same applies there. About 12GB of storage, so about 4GB is going towards the OS. Then under ‘System’, you can see its Android Version 5.1.1, and there is no root access out of the box, so you will have to root it on your own, if you need those elevated privileges. And that’s it for our quick look at CPU-Z and for benchmarks. So moving along from this, let’s next take a look at video performance within the KODI application. So we’re going to test video the same way that we tested it in all of the reviews recently. We have three specific clips that we’re going to look at. Two are actually 4K ultra High Definition clips; one is a 10bit 4K clip, so it’s a little bit more resource intensive, and we’re going to how that performs. And we’re also going to look at a 1080p high efficiency video codec clip, or HEVC, or H265, whatever you want to call it. We’re going to test 1080p and 4K. We’ll see how they both perform, and then I’ll give you guys my final thoughts when we’re all done. The first clip we tested was some 4K Space X footage, and the Q-Box it played back great, with no issues whatsoever. We then tested the 10-bit 4K file, and it did have noticeable lag and noticeable out of sync audio. There were all sorts of issues that plagued that file, and I’m not too sure what the reason is because we have played it no problem on other media players. The only thing that I can really assume is that it’s something related to the Wi-Fi or the throughput of the network performance, because there’s really no other difference here. It has 2GB of RAM- it’s not a limitation of the RAM. The Amlogic S905 processor supports 4-bit 10K video. It appears to be a limitation of this device, whether it be software or hardware-related right now. And then we tried the HEVC clip, and it played back great, with no performance issues from the Q-Box. We haven’t seen an HEVC file play back poorly in a long time, so it seems at this point that we’re probably going to get solid 1080p performance out of all of the Amlogic S905 media players. So moving along from video, let’s finish off this review by going over some gaming. I’m going to be testing the box using Asphalt 8, and using a Nyko PlayPad Pro to remotely control the game. I think that the Q-Box did great. Asphalt 8 isn’t a very resource-intensive game, but we’ve seen that same game play a lot worse on other devices with the same processor. Most recently we saw it perform really badly with the MK808B Pro. This TV box had no issues with things like the Bluetooth gamepad, disconnects, or slow motion video playback or audio or anything like that. It was a very enjoyable gaming experience, even though I would say this really isn’t meant to do much gaming with, the lightweight stuff doesn’t seem to be a problem. 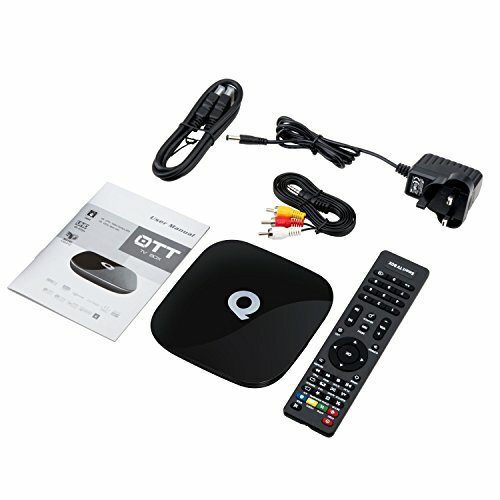 To give you my opinion on the rest of the Q-Box, I think in terms of its pricing and its hardware, that it kind of sits in a weird position on the market. 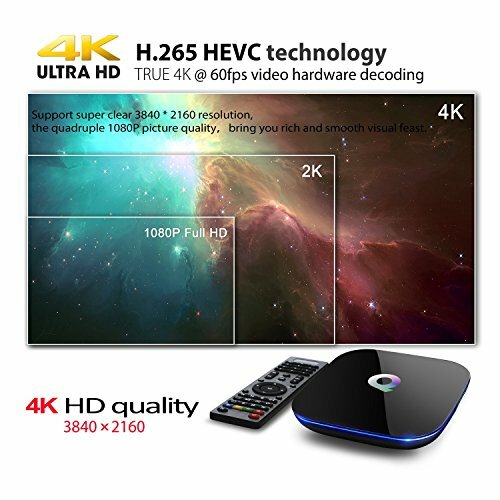 It’s in between those flagship TV boxes and the entry level TV boxes in terms of its build and its pricing, but you really do get a lot of unique features with it. You get dual-band 5 Gigahertz Wi-Fi, gigabit Ethernet, the beefy remote control; all of that stuff does add up. I mean, even the optical SPDIF, the stuff really does kind of add up when you think about it. For that extra twenty quid, I think that it’s worth it. The only real difference that I’ve been able to tell between this and flagship TV boxes, like the NeoU1, is that it’s missing 802.11ac Wi-Fi. If they could have managed to incorporate ac Wi-Fi on this thing for maybe even five or ten quid more, it would truly be a flagship killer. Even without that, it’s still a really good TV box. A lot of people don’t even have 802.11ac Wi-Fi, so if you don’t, then you wouldn’t even notice a difference anyway. Solid Box: Better than Budget, not quite Premium. Overall a good box for the price. It is priced slightly higher than the budget boxes, and you do get more bang for your buck, but the manufacturers should have went the extra mile and added a few extra features to make this a real flagship box contender. Still, for £60 you cannot do much better.